30,000 copies printed and distributed. Sent to all Sausalito resident addresses (5,500). Fisherman’s Wharf, over 50 Bay Area concierges, Ferry terminals, visitor centers, Visit Sausalito website, Chamber website, local schools, VRBO and Air BnB lodging and multiple community locations. Available online 24/7. Affordable advertising by pinpointing to right people to advertise too. Residents found it extremely helpful they had a directory to look up local businesses. Residents are more likely to shop and use local services if they know your business exists. Advertorial and print Advertising options. Over 25,000 hits per month. 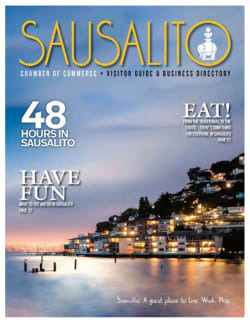 Free Banner ads on both Sausalito.org and VisitSausalito.org websites—Ask for details! Up to an additional $1500.00 value with ad purchase. It’s the “what to do” guide for all visitors. Your business is listed in Visitor Map directory and numbered location on map displays in multiple locations in Sausalito. Chamber Visitor Kiosk gives to every kiosk visitor coming off the ferry and bike parking areas. Multiple platform exposure. Map is distributed to over 50 Bay Area concierges, local business, visitor centers, cruise ships, tour buses, on ferry brochure rack, Visit Sausalito website exposure, Sausalito Facebook page, Chamber website, VRBO and Air BnB lodging and bike companies. Available online 24/7. Visitor map print advertising options. Affordable advertising that adds value to the visitor experience. So Many Benefits to Advertising with US!